4.5 stars Wow. Is this really being shelved in young adult fiction? Laura Whitcomb's writing is deliciously wordy, witty, and wonderful, and the story surprisingly complex with many mature themes. The author did a fantastic job of minding the formal speech and thought patterns of Helen's background and contrasting them with the jarring reality of present day, all while ruminating on human existence and forgiveness and the value of a life well-lived. This is an exceptionally intelligent YA book that does not spare the emotions of love and grief and the heavy weight of responsibility. I particularly enjoyed Helen's delight at the burst of sensations she experiences when as she discovers the touch and taste of certain things for the first time, as well as the sad, aching pull of her attachment to her human hosts. The suddenness of the physical relationship between Helen and James surprised me, though, as until that point everything had unfolded very slowly and naturally. Still, the connection between these two lost souls is undeniable, as they are so well matched as lovers of literature, people of integrity, and most profoundly, as the only known beings in that plane of existence. I'm astounded by the places this book was bold enough to explore, and I am deeply satisfied with how the story was resolved. It's truly remarkable when an author can make a ghost feel so eloquently and painfully human. 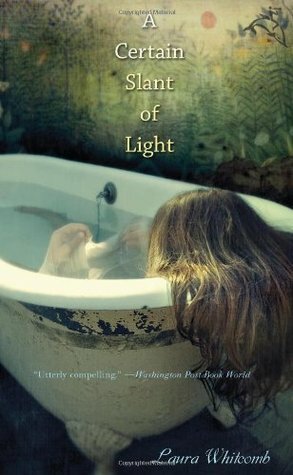 Sign into Goodreads to see if any of your friends have read A Certain Slant of Light. “He kissed me for a long moment, holding my shoulders, perhaps to keep me from pressing my whole body against his. Then he tried to lift my bag. "My God," he said. "What happened?" A lot of people like this. I'll have to try it sometime. Thanks Lora! I was pretty blown away by the book. I think most people who enjoy wordy writing (and who enjoy books like Shiver) will like it. There are certain...repercussions from Helen and James' actions which made me a little uncomfortable. But after thinking about it for several days, I'm still okay with the choices the author made. I hope you enjoy it as much as I did! Hah, this does seem to be a very polarizing book. I think you have to be in the right mood for it, too. Or maybe I was too young when I read it. I'll pick it up again to see. I loved this book! It's so different and bold, but sensitive, too. I was shocked by some of the things that happened, but like you, I'm ok with it. 100% agree with your last line. Helen's humanity stuck with me. I loved this too, SR! I can see how some people might not like the style, but I thought both the writing and the story were incredibly beautiful. I'm really looking forward to the follow-up book. There's a follow-up book?!? Score! I loved the scene where they're in the classroom and James pulled the desk she was sitting on. It was just so sweet and thrilling and romantic. It was such a little scene, but it's stayed with me. Yes, the companion novel will be about Jenny and Billy, which makes a lot of sense. It's been awhile since she finished her first draft, though. I seem to recall hearing rumors that it might be out next year, but I can't find any confirmations right at the moment. I like that scene, too. I also love the one where she guides his hand writing...and all of her wistful feelings towards Mr. Brown. Such an amazing book. Ha! I knew it! I just did! Aftertime just doesn't have that special ingredient we both need. You finish Aftertime, I'll read Raw Blue with Catie ( want to join in? It's really short.) and then it's Stoney time! This was probably one of the first books I read that took romance in YA to such a beautiful level. I'm so incredibly excited to hear that there might be a companion! It would be really wonderful to see how Jenny and Billy managed afterwards, hopefully it gets out there soon and live up to the first one. :D This makes me want to go back and read the book again! Have you read other YA books that have similarly beautiful romances, Jessica-Robyn? If so, please share the titles! I loved this one, would love to find more like it. It's so intelligent and thoughtful, unlike any other book I've ever read. And I think writing Jenny and Billy's story would help some of the uneasiness I felt about the end. Maja--that sounds like a good plan. :) I might join you in the Raw Blue readalong, I've been wanting to read that for awhile and now that I've read the author's other book Saltwater Vampires I'm especially eager. The writing was really excellent. Great review! I was surprised by how much I loved this book. Mostly bc I did not agree with a lot of the actions/decisions that were made. What I like the most about the book is that it has be at least a month or two since I first read it and I sometimes find myself still thinking about it. There are so many levels and reasons to love it or hate it. Thanks Jade! It's one I thought about a lot after I finished it, too. I was also uneasy with some of the decisions that were made and some of the things that happened at the end, but after sitting on it for a few days (view spoiler)[and taking into account all the negative stuff that had happened before in Jenny and Billy's lives and the note of wonder that entered into it after they realized everything had changed (hide spoiler)], I was still okay with it. I am glad, though, that we may get a chance to see what happens next. Even if that doesn't materialize, however, this book really does stand on its own. I'd just like to see more books by this author, though! I don't know why I didn't enjoy this book. It was making me so anxious while reading I had to drop it. And when I think about it I still feel like nails-on-a-chalkboard kind of feeling. Wendy Darling wrote: "Yes, the companion novel will be about Jenny and Billy, which makes a lot of sense. It's been awhile since she finished her first draft, though. I seem to recall hearing rumors that it might be out..."
Oh yes, I loved those parts too! I added the sequel to my TBR. Thanks for letting me know about it! It will be interesting to see how things work out for Jenny and Billy. I absolutely loved this one. One of my favorites. Some people don't like it though, because they think the actions of the characters are immoral. Morgan, I can see how people might have a problem with some of the repercussions. If the story weren't told in such a sympathetic way, I might've had a problem with what happened too, since I normally hate this sort of thing in other books. Since Helen and James were both in an extremely unusual situation and hadn't had to consider that kind of thing for literally hundreds of years, though, I sort of understood how it could happen. I don't believe it was done maliciously and I think they were just trying to survive as best they knew how, so I wasn't upset with them. Lisa, I was so thoroughly immersed in this book and I got really nervous for the characters towards the end, too. I think the author did an amazing job with setting certain moods, so I don't blame you for being upset by it. Sometimes the book just doesn't appeal to everyone, though. The language is kind of dense. Great review, Wendy. I loved this one and agree with your opinion. I wasn't really okay with some of the things happening, likely the same things that made you uncomfortable, but somehow at the end of the book I was alright and actually happy with the way it turned out. I'm anxiously awaiting the rest of the story for Billy and Jenny. Thanks so much, Monica. I loved this too, and I'm really looking forward to seeing what the author does with the story. It does worry me a bit that it's been so long (six years!) since this was published, but...maybe that will be a good thing. At least she's not just churning it out to meet a deadline. Thanks Greta! I hope you get a chance to read it. It's so different from all the other YA out there. Oh yes yes yes!! My library actually has it!! I am shocked!! My library rarely has anything!! Awesome! I can't wait for your review. I'm always a little nervous about recommending this one, people seem to either love it or hate it. Fingers crossed for love on your part! Hah, I won't take offense if you hate it. But I will take FULL CREDIT if you love it. Another awesome review! I keep forgetting to grab this book at the library! I've heard how wonderful it is countless times! So glad you liked it! 5 stars says it all! You put into words what I love so about this book. Not to mention all the undertones of human nature and spirituality. This, to me, would be an excellent book group discussion. I truly would have loved to discuss this back in my high school English class (though I admit I probably would have found it a bit tedious in the beginning). Thanks J.D. This book is amazing! I have a few friends here on GoodReads who are reading it now, and I can't wait to hear what they think. I didn't get to discuss it with anyone myself as I was reading it, either, and it's definitely a good book club type of book with all the different themes it addresses. Not to mention the morality of certain things, of course. Oh yes, the morality aspect...(view spoiler)[especially concerning the profound effects of Helen and James's actions while in possession of Jenny and Billy's bodies. Or even the larger aspect of what's on the other side of Death's veil? The allusions to something sinister lurking there. (hide spoiler)] Yes, lots to discuss. I didn't have anyone to discuss it with when I read it either (nearly a year and a half ago), so it's great to hear what others are saying about it (and that people are *still* reading it). Oh J.D--could you please go back and put spoiler tags in your post? If I don't hear back from you fairly quickly I'm going to go ahead and just delete it. Sorry about that. I thought I'd kept it vague enough to prevent spoilers, but on second reading, I realized that a bit of it may be spoiler-y. This book is so beautiful! I loved this so much! *sigh* I read this one a couple years ago and it's one of my favs too. I remember reading the author's blog when she was working on UNDER THE LIGHT. I'll have to look and see if it's out yet, or scheduled to be out soon. Might even have to read ACSOL again. Thanks for reminding me. your review helped me pick this book and I am so glad I did I adored this book! I agree about it not reading as YA, more like horror. I'm only halfway through and my stomach is in knots. Hoping to get a copy of this one soon, and happy that when I searched it on Goodreads to add it to my list, I see your 5 star review! That's pretty high praise on its own. So now I am really excited to dive into this one! !